Chapati has become a regular food even in south indian house holds. When I was young, I remember chapathi’s being made only very rarely. It was always poori that was made regularly. The chapathi dough was mixed with a good amount of oil for flavor and softness. If made correctly, the extra oil isn’t even necessary. We will be making chapati dough using a technique used in baking called autolyse. Autolyse is a term used in baking breads. It is nothing but a resting period between mixing and kneading. It helps the flour to absorb more liquid. Its nothing but mixing the flour and water just until mixed and the water is not seen anymore. Mixing too much will activate the gluten in the flour too much and interfere in absorption of water by the flour. Salt is never added to the flour during autolyse according to Raymond Calvel, inventor of autolyse as it inhibits the absorption process. Note: Indian Chakki Atta (whole wheat flour) is preferred for this recipe. This is a 50% hydration dough. We will be using 1 cup flour to 1/2 cup water (by volume). Put one cup of flour in a bowl. Add half a cup of water and mix with a spoon. We are not trying to knead anything yet. Just mix. When there is no more water visible, stop mixing. Cover the bowl and let it rest for 30 minutes. After 30 minutes, add the salt, gently mix the dough for 2 minutes, just enough to gather the dough into one piece. Cover the bowl and set aside for 30 minutes. Divide the dough into lime size balls. Set an iron pan on medium high heat. Let it become hot. Take a dough ball and generously dust it with flour. Roll the dough into a 4 inch round on a flat smooth surface using a rolling pin. Place the chapati on the hot griddle. Let it cook for 10-15 seconds until bubbles start to form on top. Flip the chapati and cook for 30 seconds more. Gently press on top of the chapati to make the chapati fluff up. Flip one more time and press on top. Chapati should beautifully fluff up. 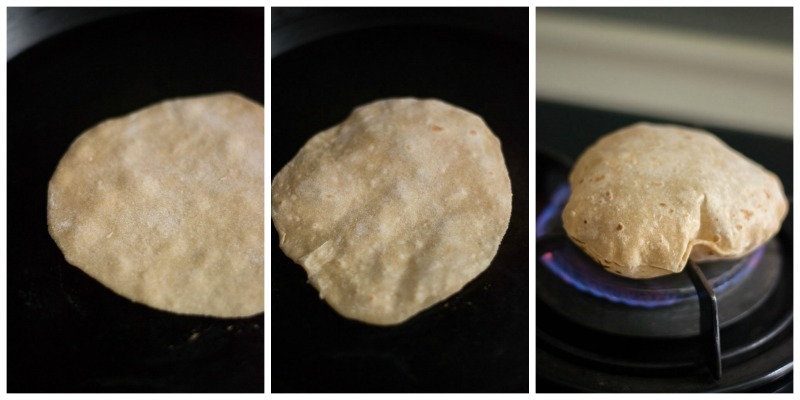 If making phulkas, just flip on direct flame and it will fluff up. See video below for more details. Some of you have complained that the dough being little sticky and rolling has been a problem. The wheat flour differs from place to place and from brand to brand. Its perfectly ok to mix in some dry flour to the dough to make it soft and pliable after the 30 minute rest. Chapati dough should not be sticky. You should be able to roll it well after the initial dusting in the flour. So feel free to add flour if need be. Ensuring that the chapati is flipped only twice during cooking makes for a soft and fluffy chapati. Line a bowl with cotton towel. Place the cooked chapati on the bowl and cover with a towel. Chapati will stay beautifully soft for a long time. Recipe for making chapati and roti using autolyse technique. Chapathi stays soft for a long time without getting dry. No knead chapati dough. Put one cup of flour in a bowl. Add half a cup of water and mix with a spoon. When there is no more water visible, stop mixing. Cover the bowl and let it rest for 30 minutes. Divide the dough into lime size balls. Set an iron pan on medium high heat. Let it become hot. Take a dough ball and generously dust it with flour. Roll the dough into a 4 inch round on a flat smooth surface using a rolling pin. Place the chapati on the hot griddle. Let it cook for 10-15 seconds until bubbles starts to form on top. Flip the chapati and cook for 30 seconds more. Gently press on top of the chapati to make the chapati fluff up. Flip one more time and press on top. Chapati should beautifully fluff up. If making phulkas, just flip on direct flame and it will fluff up. Excellent information. Loved the measure of water (50%) and the details about autolyse and mixing salt after resting. This would be done intuitively by experts but always defeats the beginner like me! Many thanks for the tips, is my understanding correct that after placing cooked roti in the bowl, cover the bowl with towel, please correct me if iam wrong. Hi Sandhya, Place a towel inside the bowl. Place the chapatis on the towel lined bowl. So the hot steam from hot chapatis will be absorbed by the towel, and the chapatis wont become soggy. My dough was v thick .. N chapattis were a lil hard.. It did puff up but not so much.. Can I add lil more water ? Hi Arthi, Yes. the water will always vary depending on the flour. So do add water if very dry. Thanks very much. You made the basics clear. I understood where I had been wrong. Thank you very much. I tried your recipe and was so pleased that my chapati turned out great! Not all puffed up as in your video but those that did really made me so happy! Thank you for the detailed explanation and recipe. I’m so gonna make this again soon! I’m glad I came across this site! Saved a lot of my time and effort required. The chapathis turned out super soft. Thank you very much for sharing. Appreciate your help. I will try it before I write a comment.Thank you very much for the recipe. Hi, Love your blog and the 10 min kurma was awesome !! I tried my hand at this , twice and both the times the dough ended up way too sticky. It was soft, I could feel it, but really sticky, that I couldn’t roll it out. I had to use nearly another 0.5 cup of flour in rolling it out. Any idea what I could be doing wrong ? Are the timings strict ( 30 min blocks ) ? It was about 45 mins before I could add the salt, so did the 15 extra mins mess it up ? It might be because of the way you measure flour. Also the wheat flour sometimes takes in less water and sometimes more. Its perfectly ok to add flour if need be. Hi. I’m not sure what happened, however the dough continued to be moist making it quite sticky to cook. Any idea on what I should be doing differently? If the dough is very moist, add in more flour. Dont be afraid to add more flour. Everyone measures flour differently. Its perfectly ok to add a few tablespoons of flour if need be. Cant thank u enough cos I never could make chapathi and now with ur method, i get it perfectly right. I am also trying to add oats flour, besan and ragi flour…what ratio would u suggest for 1 cup of flour and how much water should I add? I tried your recipe. 1/2 cup water for 1 cup flour is too much. Also in your video, you’ve certainly added more flour than mentioned. Hi ..so was lookin at this recipe for the chapati..jus a small doubt..v don’t add salt to our chapatis..so do I still need to mix it at the end of 30 mins n let it rest again for 30 mins or r the first 30 mins good enough. . Omit the salt but mix and rest again! I use cast iron for my rotis too! Perfect! Thanks much. Your recipe is a life saver yummy home made chapathis then ! ? Your method just saved me from Chapathi shame – the feeling that I can never figure it out ! It’s worked wonderfully well every single time and the Chapathi store well too ( that’s a plus!!!). Most days we come home late and it’s so hard waiting for a whole whopping hour to start rolling them out. Do you think if I make the dough in the morning it will turn out okay ? The same texture etc. such an odd conundrum… too little time to roll out in the morning and too log a time to wait to roll them in the evening. Let me know and thanks once again ! Hi Aparna, I make the dough and store in the refrigerator and use it. You can use the dough for two days without any problems. Thanks for the recipe. Please don’t make phulkas on direct LPG flame as it’s not good for health. Instead try wooden flame ? Waoo.. I was just in need of this .I love you . this process is so simple . I wasted so much energy and time before. But now I would always wasn’t to make chapatis .hahahh .. Thank you very much mam. Thank you thank you! I tried this out and the phulkhas came out just perfect! I had previously been kneading waaaay to much and messing it up. Not a good recipe..not good website too.I have made worst chapati today by seeing this recipe.rolling is really very hard as the dough was more soft.. This is an amazing website. Just because you tried a recipe and it didn’t work, please don’t say that it is not a good website. I have tried several recipes and all have come out AMAZING. Try out things and learn to ask questions if something goes wrong instead of placing blame. There could be many reasons this didn’t work for you (water hardness, quality and type of flour used, amount of water). Thank-you very much,mam. I tried your recipe it was nice and tasty,really the way you present made me very impressive. 1 cup of flour is 240 ml. 1 teaspoon is 5 ml. The measurements are correct. Thanks. Just came across ur blog and had a glimpse of the recipes…very impressed by ur recipe collection! Will definitely start trying them soon. Well, I wanna know which is best in terms of healthy food, whole wheat flour or chakki atta? Whole wheat flour and chakki atta are the same. Chakki refers to the milling process. Thats all. 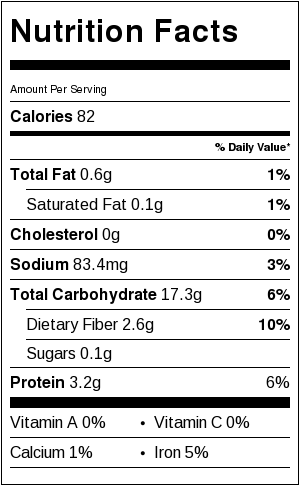 So the nutritional content in both are same. Isn’t it? Or does it differ? I mean any loss in nutrients due to chakki milling process? Sorry to bother with questions again and again? Suguna, such a thorough recipe and so scientific. I make it the same except for mixing the water and flour and resting in the beginning. Going to try this technique tonight. I know it is a everyday food for many of us, but reading your recipes are always a pleasure. I am jusr learning to make chapatis. I had tried making them in the past without success, but this time I was able to find atta flour, which seems to be the key. I have tried them twice, and most of them puffed. They were delicious, though, and leftovers stayed soft in a plastic bag for lunch the next day. However, I did have some sticking and/or burning, both on a nonstick pan and a well seasoned iron frypan. The pans I have are used for other foods as well. I thought perhaps I should have a pan devoted only to chapatis or other flatbreads made without oil. So this morning I bought a new lodge cast iron griddle. I was looking for seasoning tips online and just found your site – I will try your recipe next! Before I do, though, can you give me some advice how best to season ny new pan before I use it? Should I use any oil at all on it, or maybe just rub it with flour or cornmeal? I don’t want the pan to have baked-on oil, which seem to cause the burnt spots. Also, what is the best griddle temperature? Unfortunatly, I am now in my winter home, and only have an electric stove here, much to my frustration. Also, can atta flour be used for other baking? I know it is not suitable for yeast breads. The smallest bag I could buy was 20 pounds, and there are only two of us. Hi, to avoid the chapatis sticking, you can slightly grease the pan with a tissue dipped in oil. If the heat is high, the burning is more. Just grease the pan with a tissue before every chapati. That should solve the burning problem. You can see my post on how to season a pan to get more details on seasoning. About using atta flour, you can use 50% all purpose flour and 50% atta flour in your regular yeast bread recipes and it works. It came out so good that I felt compelled to leave a message! Keep rocking! Did u recommend half cup water for all types of Attas ? ,or we need to add water gradually until we get a desired dough consistency. Most chakki atta takes up 1/2 cup flour. 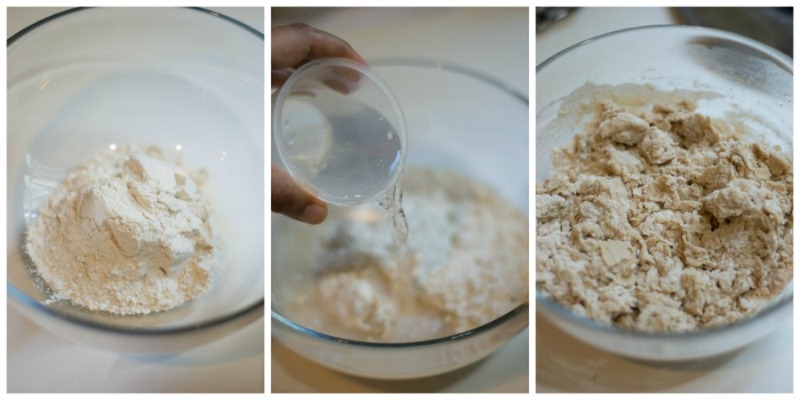 If you find it watery, you can always add a little flour. Hi. I have tried making chapathi many times but never got soft chapathis. Even if little soft they become hard in a few seconds. But thanks to your recipe my chapathi stayed soft even for half an hour after i made.. thanks a lot. Also chapathis became little rubbery since dough was slightly watery.how to avoid that? Thank you Deepika. Try to avoid adding lot of flour while rolling, Also I have noticed, resting the dough longer helps, After the final kneading, rest the dough for more time. These days I make the dough, do the final kneading 3-4 hours before. The resting helps in more softer / better chapati I feel. Thank you so much. Glad you like the recipe! I had read many of your recipes and specially loved the tale behind that.Thanks for this recipe and for the first time my chapatti’s came soft . Thank you! Really glad that you liked it. Hi, very nice mothod to prepare chapathi dough.. Thanks for saving our time and effort. I just want yo know if we can prepare it in the afternoon itself for making chapathis for dinner? Thank you. Hi. 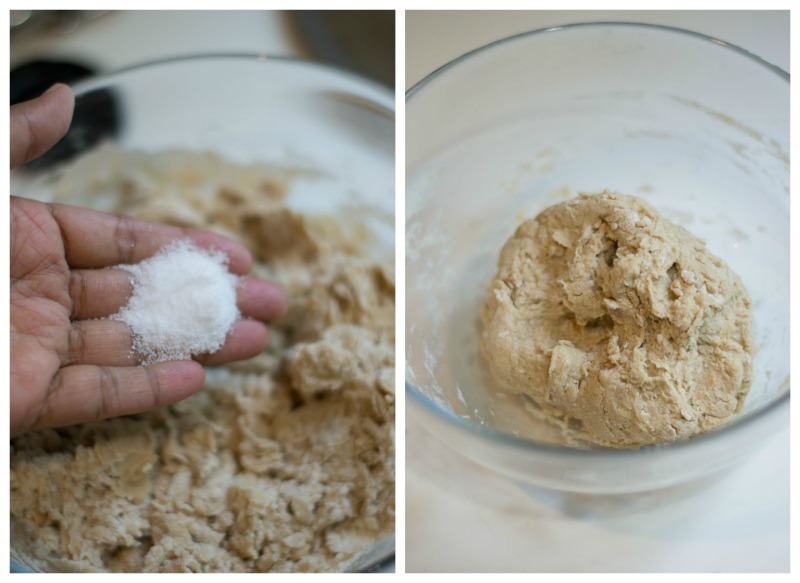 This is the easiest chapati dough recipe. Takes the guessing out of dough making. I have used it 3 times already – made parathas though(the kind where you roll it out round once, coat with a little oil, fold and then roll out again as a triangle) not chapatis. My family loves this. Thank you. Thank you so much. Really glad that you liked the recipe. Thank you so much Deep. Really glad that the chapathis came soft. Will post the pooris in the coming days. Hi.. Thanks for the yummy recipes. Tried your chapathi. They fluffed up really well. But it was a bit on rubbery side after making. Not sure what I did wrong. I used oil after few attempts. Any other tricks you would recommend?? you can keep in a box with a covered lid. the steam will keep it soft. phulkas are really good eaten hot! Hi…Can you please tell some tips to make soft and fluffy pooris too. Thanks.. Thank you so much! Glad you liked the recipes. Happy Cooking. So I saw this recipe last night and I was going to make it first thing in the morning…well, morning became early this evening but it didn’t matter…the result was excellent; soft roti! My son loves roti especially broken into pieces in a bowl of milk. He had two before bed. Love the format of both the text and videos of your recipes…hoping to try some more! Thank you so much Faisal! I use lodge iron cast pan for chapathis and I’ve induction/coil stove due to which I cannot pluff up pulkas/chapati like we do on gas stove. My husband loves North Indian food as he lived there for few years. He always praises the chapatis once we had in a gurudwara. I’ve been trying hard to perfect my chapati recipe from few years but I always end up with harder chapathis even though I use ghee or oil while cooking. I tried placing them in hot box too. I tried hundreds of times, tried different recipes, watched many videos. They will be little soft but not very soft. 1) Can you please tell me some more tips on cooking softer chapatis on lodge iron cast pan? 2) Does over cooking chapatis make them harder? I doubt if I cook them little longer. 3) What heat is good like medium/low-medium/medium-high? 4) how do I determine if chapati is cooked properly. 4) should I roll the chapathi too thin? 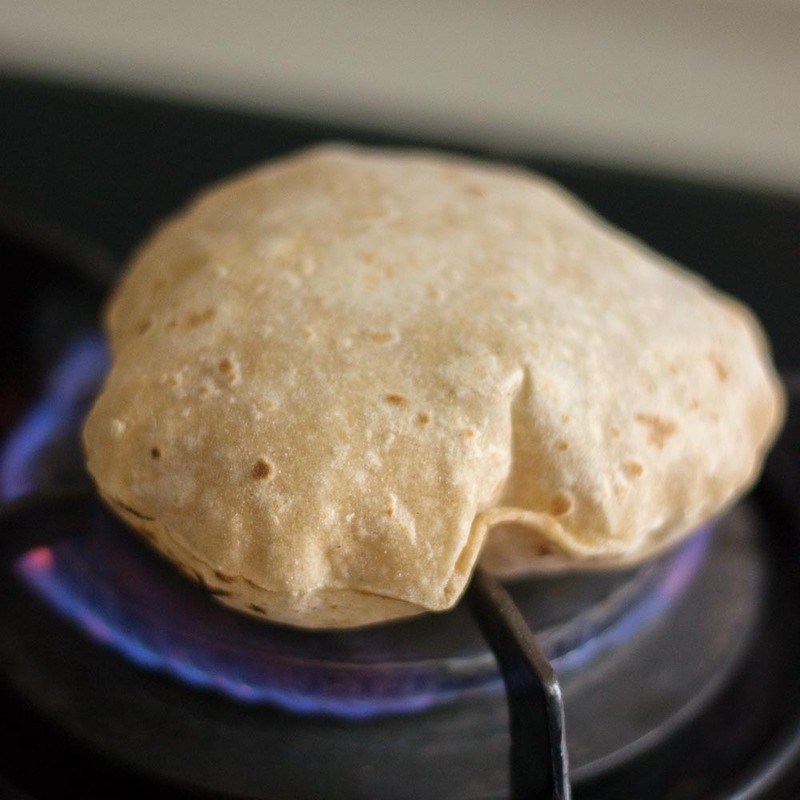 5) can I get softer chapatis on iron pan without using oil/ghee? Softer dough makes softer chapatis. You can try the autolyse method for making dough and it produces really soft chapatis. The iron pan is just a medium and it is not an assurance for getting soft chapatis. The dough will determine the end product. So lodge or not, its fine. Try storing cooked chapatis in a hot box lined with a towel. The steam will keep them soft. I tried this using Aashirvad Atta , the dough was rubbery kind and did not fluff up. I saw it you have mentioned to use Chakki Fresh , Is there any specifications for Aashirvad ? Any store bought indian atta would work fine. Try making smaller rounds while making chapati! I’m a huge fan of your recepies and how clearly you explain them. Can you share a recepie of mayonnaise…? Sure Jaishree. Will post soon! Hi I love your recipes. I have tried your sambhar recipe. Turned out great. Do you have recipe for poori masala curry? Is there no kneading here after adding salt after 30 mins ? No. No need to knead in this method. I always prefer cast iron pans. Also always keep separate pans for dosa and chapati. Chappathi dough making process looks very different.I strongly believe on yours experiments. Would try soon. Mouth watering and fantastic video. Thank you very much for your efforts. Hi mam I tried idly milagai podi.its so good and tasty.usually I like to read your recipes and the way you explained very clearly each recipes thank you so much mam.